Sold in 1920 to the Green Star Steamship Co.
Scrapped at Wilmington, Delaware in 1948. 70k Photographed by her builder, the New York Shipbuilding Company, at Camden, N.J., upon completion in late 1915. 54k Photograph may have been taken during an inspection by the Third Naval District on 1 August 1918. Dictionary of American Naval Fighting Ships: [The third] Plymouth (ID-3308), built in 1915 by the New York Shipbuilding Co., Camden, N.J., was taken over from the Italian-American Steamship Co. by USSB and simultaneously transferred to the Navy 30 July 1918, and commissioned at New York Navy Yard 2 August, Lt. Comdr. H. A. von Pflugk, USNRF, in command. Assigned to NOTS, Plymouth loaded military supplies at Baltimore, sailed for Hampton Roads 21 August 1918 to join a convoy bound for France, and arrived Brest 11 September. Upon returning to New York from La Palliee 17 October, the ship again sailed for France with an Army cargo, arriving at St. Nazaire 9 December 1918. 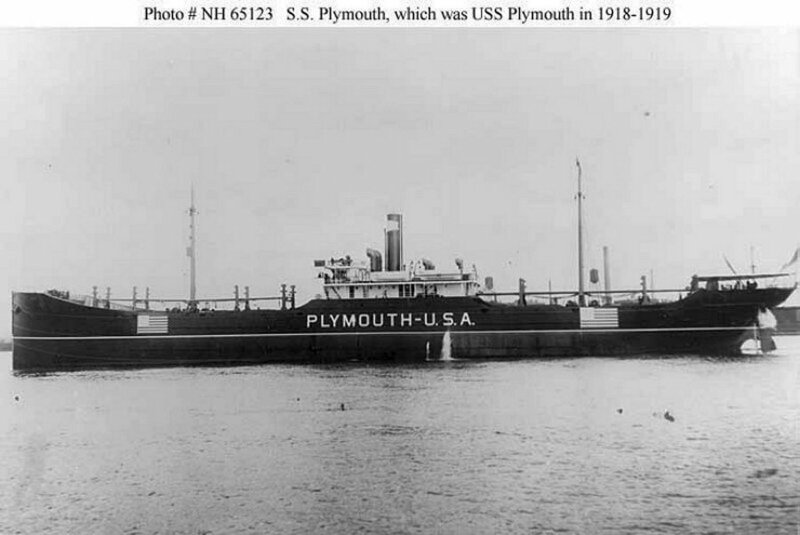 Plymouth returned to Philadelphia 10 January 1919 and steamed on to New York. She decommissioned there 25 February and transferred to USSB for disposal. She was sold to Green Star S. S. Co. in 1920.